Have you heard? America’s obese. A search on NYTimes.com for “obesity” returns over 10,000 results of articles & multimedia distributed online in the past 30 days alone. Morgan Spurlock marketed the documentary Super Size Me on the back of popular media on obesity. Basically, you’d be hard-pressed to find someone who doesn’t have an opinion on weight gain in America — whether they’re overweight or not… or American or not. Telling people that they’re overweight and that everyone around them is overweight is a great way to get people to believe that they’re overweight and that everyone around them is overweight. There’s a lot of persuasive power in repetition. So how intimidating is it for consumers who are ready to diet to actually get started, with that prevailing rhetoric of obesity creating some seriously negative anticipation? And the bigger question, for these 30 Days of Persuasion: How does anticipation of an outcome affect consumer decision-making? a consumer makes a choice, they experience changes in neural activity. His work is part of a growing body that suggests that consumer decision-making is not always based on information about a product that the consumer has previously encountered or that the consumer ascertains at the moment of first impression with a product. Sometimes, anticipation of a purchase (or, better, the exchange of money to gain an item of desire) plays a significant role in consumer decision-making. Knutson tells us what happens before a consumer even approaches a decision-making environment. Dieters hate dieting and fall off the bandwagon ALL the time. So when a dieter considers really buckling down and learning how to have a healthy diet — that is, when a dieter’s ready to go to WeightWatchers.com — anticipation has not only set in but has likely taken over a good part of their experience with the site. And they haven’t even arrived on the site yet! WeightWatchers.com needs to both overcome negative anticipation of the dieting experience and exaggerate the positive consumption visions for dieters moving towards their goal weights. WeightWatchers.com also makes it easy for people who are crippled by previous failures in weight-loss or those who just don’t think they quite need to start a proper dieting regime with Weight Watchers to back out without feeling guilty about it. 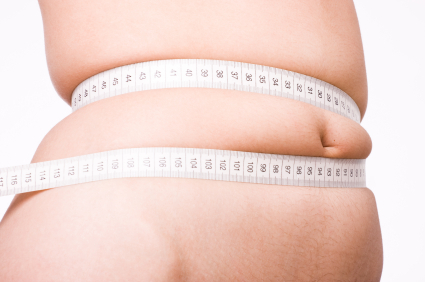 Is it powerful to hear that you don’t have to lose all that weight quite yet? Is it reassuring to know that you might not be ready to start the diet yet… and that that’s okay? When consumers have decided that they’re ready to start losing weight — that is, when they’re engaging in consumption visions — it’s the job of WeightWatchers.com to leverage that opportunity in order to persuade them to sign up. What might consumption visions look like? I’m guessing here, but let’s say it begins at fitting into old favorite jeans and ends at Valerie Bertinelli in a bathing suit. A dieting consumer likely imagines herself turning a few heads. That’s the excitement. That’s the motivation to proceed. 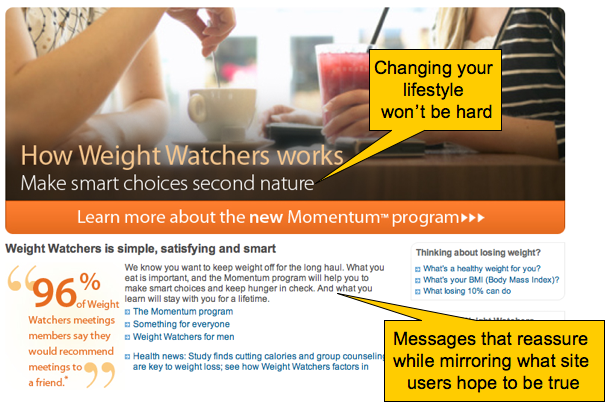 Does WeightWatchers.com play into consumption visions to persuade users to become members? The “Success Stories” section seems to try by showing video-stories of Weight Watchers members who’ve lost weight and kept it off. 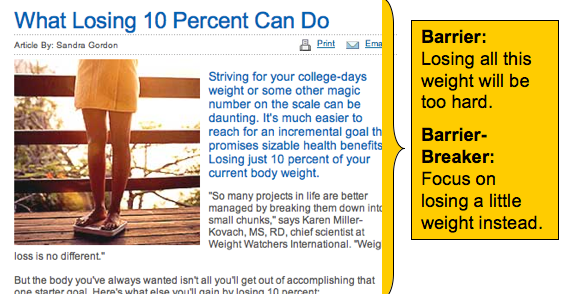 What’s interesting is that WeightWatchers.com has gone decidedly… neutral in their success stories. Sure, the stories are good… but are the people actually people that consumers envision themselves resembling after months of saying no to dessert? It’s clear that WeightWatchers.com was going for a “real people” vibe here, likely to make their stories seem more credible. Gotcha. But, for us, WeightWatchers.com fails to balance the credibility element with persuasive consumption visions that conjure up actual affect. This is a point of opportunity for a site that otherwise does a great job with anticipation. Maybe it’s time to test it, WeightWatchers.com? “Anticipation” doesn’t always mean “looking forward to” or “hoping for” something. Sometimes anticipation looks like dread (“I really don’t wanna stop eating fries and gravy!”) or impatience (“I know this is gonna hurt — let’s just get it over with”). Is dread or impatience a potential barrier to sign-up for your consumers? How is your site mitigating negative consumer anticipation?